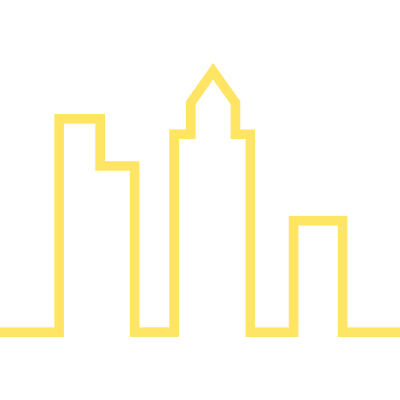 Franklintown is the neighborhood just to the north of the Ben Franklin Parkway. It was once an industrial area and started being redeveloped with large apartment houses in the 1940s. Lately, the area has seen a new building boom of apartment houses, but still has a few industrial buildings that have been converted for residential use, such as The Lofts at Logan View and The Granary, a converted grain elevator. 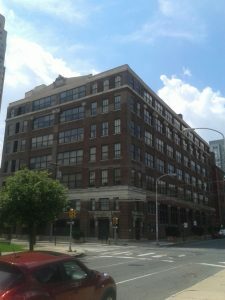 1600 Callowhill Street, also known as 352 North 16th Street, is located next to The Lofts at Logan View. 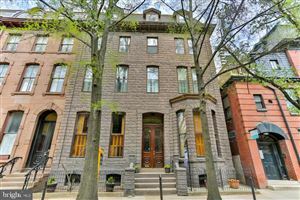 1600 Callowhill was built in 1908 by C.C. Knight for the Middishade Clothing Company, and designed by Watson & Huckel, and was converted into an office building in the 1980s. For many years, it had the U.S. Immigration and Naturalization office for Philadelphia, which moved to a new building at 41st Street and Powelton Avenue a few years ago. This current conversion is being developed by Ivy Callowhill Property, a subsidiary of Ivy Realty, and designed by BLT Architects. The seven-story building is historically certified and the renovation received approval from the City’s Historical Commission last March. The renovated 1600 Callowhill will have 93 rental units. The first level will have 36 parking spaces and room for 31 bicycles. The parking will include spaces for electric vehicles. The building will have amenities like a community room, a fitness center, and a roof deck and patio. The facade will be restored, including the decorative parapets on the roofline cornice. The building will get a new front door canopy and new windows. The first floor will have retail spaces facing 16th Street. 1600 Callowhill Street will be almost across the street from The Alexander, at 1601 Vine Street, a tall apartment tower which also has retail spaces on 16th Street. Across Brandywine Street, ten new luxury townhouses are under construction, and on the next block north across 16th Street a new apartment building is being built by Radnor Property Group and Community College of Philadelphia, which will have more than 600 apartments. 1600 Callowhill is similar to The Granary, The Lofts at Logan View, and the Heid Building at 13th and Vine Streets. These former industrial buildings are being renovated to preserve the area’s industrial legacy while providing more housing for workers of the area’s modern office and corporate economy.